South Africa won by 3 wickets. We will also have live text commentary of both games on the BBC Sport website. If it is anything like today, you won't want to miss it. I'll see thee. South Africa captain Faf Du Plessis: "That's a massive get-out-of-jail card. I felt both teams didn’t play their best. The wicket was two-paced and not a normal T20 wicket but I have a smile on my face because we won. "We didn’t start well. Twenty20 cricket is all about executing plans and we let them get away at the start. Our bowlers came back by getting wickets. "And with the bat we tried to learn from their mistakes, maybe they went a bit hard at the ball, we tried to play deeper, messed it up a little and Chris Morris, the million dollar man, saved us." "Overall, England if they think about it, at the halfway stage, in their heart of hearts they didn't think they would win so they have done really well." "Using the slowness of the pitch might have been worthwhile in that final over. Topley might learn from that, you are taught to bowl in the block hole but they were low full tosses." Adam Capstick: Are we going to talk about how well Chris Jordan has played, in spite of everyone's armchair criticisms? England captain Eoin Morgan: "After a pretty poor batting display our bowlers nearly pulled it out of the bag. Stokes and Jordan got as much as they could out of the pitch. The more and more we play the more responsibility the bowlers take on their shoulders. We created chances with an under-par score. That is a huge positive. "When the ball was new it skidded on but when it was older the pace was off and it became more difficult. Probably not as bad as we displayed with the bat though. "We have had a reasonably good run in T20s and probably should have won tonight when we didn't deserve to." Joel Heritage: Not sure if the question is "How did England lose that?" or "How did England almost win that?" Stewart A: Excellent Game SAvsEng.... unlucky Topley! That's cricket! Just Go Again! "Morris has done it again. I don't know how he has done it because there shouldn't have been two there." Stuart Mitchell: oh wow what a finish, should have been a super over though. Poor finish from Topley. Andrew Morris: Topley choked. First the catch, then the runout. Shoulda been Jordan. Still, fantastic match and ultra kudos to the bowlers. What a finish to the game. England's pain is clear to see, not least in the actions of Reece Topley, who lashes out at the stumps in fury. In short, that should have been a run out. We should be going to an extra over. Credit to England for so much hard work with the ball and in the field to take the game as close as that, but ultimately they didn't get enough runs and an error under pressure has cost them. "England let that get away again. The run out was definitely on. Topley dropped the ball, he just needed to gather it and take the bails off and we were in a Super Over." Morris hits it down the ground to Root and sets off like a train. The throw comes in, the SA pair are back for two, Topley for the run out... and he drops it! Run complete. Game over. Heartache for England. Joy for South Africa. Morris hits it back down the ground. Two runs. We are going to the last ball. Two needed. Morris hits it straight back to Topley. Dot ball. Tension. So much tension. Morris plants a full Topley ball into the stand on the leg side. Morris is doing it again. Morris gets a four. One bounce over extra cover. That is a big blow. Abbott gets a single with a punch to mid-off. Topley will bowl the last. No pressure. Rachel: So tenacious from England to have even made a game of this! Craig Lee: Can England pull this off??? Simon Goodall: Why are low scoring games more exciting, in a format that is designed for teams to score runs??? "Jordan is bowling with good pace, hitting that crease line and that is what you want. Chris Jordan in the big moment is doing well here." Kyle Abbott gets a single off the last ball. One over to go. 15 to win. "England will not be beaten." HVeinnrsyon: England can't catch Chris Morris? He's like cricketing kryptonite. George Spooner: I may have called Chris Jordan useless a few weeks ago and it was broadcast on your website. I take that back. Completely. Take a bow Chris Jordan. he is bowling like a demon for his country. His full ball is dragged on to the stumps by Wiese. England could be about to pull off a remarkable win. "This is exactly the preparation you want for the World T20." New man Wiese pulls to leg and SA take two. "I wonder if that is going to cost England the game?" Oh no! Reece Topley has misjudged a catch running in from third man. Had he set off straight away he would have been under a top edge from Chris Morris but instead it falls short! Teddov: Chris Jordan doing a good job. Doubters staying quiet. I am happy. Thomas Knights: England have bowled superbly tonight. Bowling to the conditions well. "Root feels England are right back in this. This see-saw game might just have gone back towards to England." And we swing back to England as Miller drives straight into the hands of Root at long on off Jordan. Miller follows his six with a four and, in a flash, the game swings back in the home side's favour. You can't take your eyes off this for a second. Just when SA needed him, David Miller steps up with a straight six. "It would be a stunning effort if England pulled this one around from the position they were in. "You just sense pressure building on South Africa here." Birding Vicar: Somehow Stokes and the other bowlers have made a game of this. England are really in this game now. Rossouw tries to sweep Moeen but top-edges to Rashid at short fine-leg. Suddenly, there are some very concerned faces in the home dugout. "For all money that looked like four. Great relay work in the field." "Miller is such a destructive player. He is one of those players you get excited about when you see him in the line-up." Jordan returns and does a really good job for his side. New man David Miller helps take SA past 100 but also has to survive a big lbw shout. Like Jordan's previous lbw call, that also pitched outside leg. Just four off the over, in part thanks to a superb diving stop by Moeen in the cover to stop a four. This is getting more and more interesting by the ball. "England have just been hanging on. They will be thinking what would we do for 20 more runs?" "Another batsman holes out. The wicket is just not there for that type of shot. 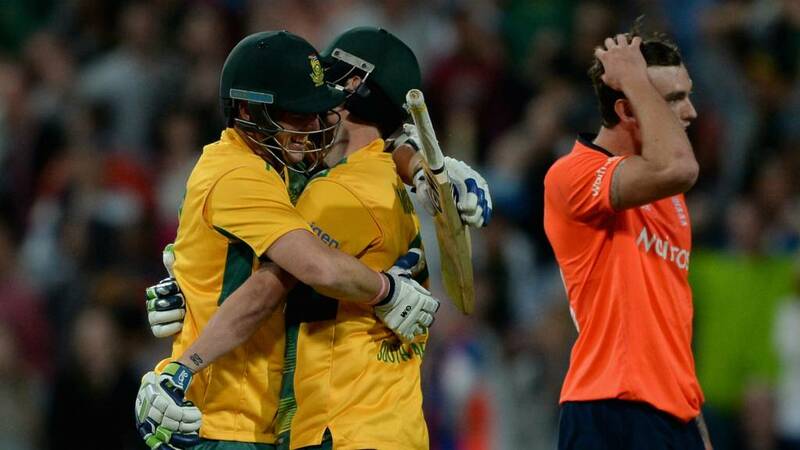 "Du Plessis didn’t get it as he would like. England, even though it is in South Africa’s favour, will think one more wicket could really turn things around." Just when you think SA are finally heading down the home stretch, England chuck an obstacle in their way to slow them down. Du Plessis looks to smash Moeen to cow but doesn't quite catch it and is caught by Stokes coming round from long-on. The home side should still win from here but there will be nagging fears. "I think most days of the week it is South Africa's game from here but England have done a good job of fighting. "But after that six it just gets things moving for South Africa." Rossouw strikes a big blow off Rashid over long-on fielder Root's head. It is the only successful attempt of a number of intended big shots from the left-hander. He clearly feels he can end England's resistance quickly. The tourists are clinging on now. Moeen Ali into the attack to make it spin from both ends. His first ball is a peach, pitching on leg and turning away from Rossouw and over middle stump. That'll sharpen the left-hander's focus. Later in the over, the video umpire is called upon to judge on a run out against Rossouw, but he is well in courtesy of a dive at the non-striker's end. "There is a new left-hander in, which gives you the chance to just pop in a couple of invaluable dot balls." Rilee Rossouw is the new man and he helps to see off another good over from Rashid. Fair play to England, they are hanging in here. SA are still in the box seat but another couple of wickets could really put the cat amongst the pigeons. "That was a strange shot. Root barely had to move. I guess Duminy was trying to hit it for six and didn’t get enough elevation." "That was a loose shot by Duminy. That has just given England a sniff of hope." England are given another glimpse of what would be a remarkable win. Duminy had just started to time the ball but he plants a straight drive down the throat of Joe Root off Adil Rashid. "Willey had to make a lot of ground to his left. He dived and he got a finger end to it. It is hardly a chance. Both of those ones would have been miraculous." "South Africa are definitely on top here but a couple of wickets could make all the difference, England need to find a way of getting these two back in the hutch." Duminy counter-attacks against Stokes to relieve some pressure by coming down the track and hammering the ball for four, wide of mid-off. After an uncomfortable start to his innings Duminy is looking increasingly more at home. Stokes almost ends a fine spell with a wicket but Du Plessis' pull drops just short of Willey's dive. Willey has been so, so close to two catches. They would have made a huge difference to this game. And pretty much everything England hit went to a man. England are still hungry for this. They sense that South Africa are under a bit of pressure for the first time in their innings. Rashid keeps the home side to just a further four runs, without really threatening. Mike Fisher: Moeen Ali what are you doing!!?? You are playing for your country - how about attempting a catch? "Stokes is doing an excellent job here." "He is not looking comfortable at the moment, Duminy." "I think some would have caught that. Moeen just didn’t really commit to the possibility of the catch there." Another chance goes begging as Moeen doesn't commit to a catch as he runs in to try and claim a top-edge by Duminy off Stokes. He is not the quickest, Moeen, but he could have been more alert to prevent that dropping safe on the turf a yard or two in front of him. It is another good over, that could have been great, from Stokes. This could be the crucial moment. Spinner Adil Rashid comes on. He is capable of picking up wickets but could also be expensive. He makes a bad start as Duminy claims four from his first ball with a pull through midwicket. Rashid does well after that, though, conceding just three more runs. "David Willey was absolutely at full stretch, he ran 20 yards or so, a valiant attempt. That was no more than half a chance." "It is the sort of one that only Jordan would have caught." England can't afford to drop any chances. Even the incredibly difficult ones. David Willey is at full stretch chasing back to try and catch a lofted straight dive from Duminy. He would have been a worldy of a snare and he gets his fingertips to it but the ball goes down. Next ball, Stokes hits the same batsman full on the pad and screams for lbw but is turned down. Just going down leg, it looks like. Stokes is causing problems but England need more. "It is not enough runs to play with for England so every boundary really hurts." Du Plessis makes his presence felt with a belting drive through extra cover for four off Jordan. He is looking to be aggressive, the South African captain, trying to swing the game firmly back in his side's favour. Jordan has a another shout for lbw against Duminy that is knocking all three stumps out but pitched just outside leg. Ben: Who was that bloke who said Stokes was overrated earlier? Stuart Mitchell: I think 134 is a below par score, i don't think its 50 short though, this wicket isn't perfect, looks two paced, 150 was/is par. "It just shows you how valuable Ben Stokes can be. A good solid all-rounder." Ben Stokes really does makes things happen. A wicket maiden with his first over. JP Duminy is the new man and watches Du Plessis waft at a few from the non-striker's end. "To me that looked absolutely the right decision. Sometimes TV can create that doubt." "I think you would give that out every day." The tiniest bit of light at the end of a very long tunnel for England. Stokes is into the attack and draws an edge from Amla that loops the ball for Willey to catch on the slide in the mid-on region. The third umpire takes a couple of looks on video before finally confirming the wicket. "It has to be just about perfect for England from here for them to win. "England are just having one of those good spells that they haven't had many of since Roy and Hales." An impressive start from Jordan, who adds to his wicket of De Villiers with an lbw shout against new man Faf du Plessis. It is just going down leg and is turned down by the umpire but represents a tiny sign of some pressure building. "Good from Jordan he looks delighted. "Alex Hales did a great job he got there early and set himself. It might be a bit of luck that England need. "It is good for Jordan as well, he has been under pressure from the ODI’s, you could tell by the celebration that it meant a lot to him." Now then... England strike as Hales claims a high catch in the deep after De Villiers top-edged a Jordan ball to leg. Still a long way to go but England have dismissed a big danger man. "Buttler definitely should have caught it. It was a reasonable catching height, once you get both shoulders around you are usually in a good position to take it." "That is a chance missed for England. Buttler probably should have caught that. That is going to be a costly miss for England I think." Every economical over from England comes with a key caveat - that it did not contain a wicket. For only wickets will help England here. They simply don't have enough runs to rely on keeping it tight. Which is why Jos Buttler failing to take an edge off Amla is the stand-out moment of this over. Topley did his bit, but he is let down as the keeper misjudges and only gets his fingertips to the ball. "He has been very strong on his legs. That is incredible how at the last minute he whips it with his wrists, like in tennis, a topspin forehand." Simon Goodalll: Phooar, at this rate Eggheads looks a good bet at 6. That is a better over from Willey. Much tighter in line and length. De Villiers comes close to a boundary but some smart fielding by Topley, running round from third man to prevent it, but no fielder can stop a leg-side flick from Amla crossing the rope. Steve Clark: Considering our batting is supposed to be our strong point, I'm not looking forward to this run chase. Done in 12 overs? Reece Topley starts well, but there is absolutely no pressure on the home side and Amla and De Villiers are able to add a comfortable three runs to their total. "When you haven’t got enough runs on the board, the last thing you want to do is chuck two down the leg side." With AB De Villiers opening, this could be over very quickly. However, he doesn't have to do anything for SA to score two fours from the first two balls of David Willey's first over. The first is four leg byes, the second is a whip to leg by AB's opening partner Hashim Amla. 11 off the first over. Here we go then. Will this just be a easy, straightforward chase or is there a twist in the tale? Kieron Bird: Can we start over and have another knock? That didn't really go to plan, England. Steve Tredup: After being 50-1, we scored only 12 runs per wicket instead of 12 per over. Alex Haworth: 134 is a pathetic total in Twenty20. I'm not even watching this procession of a run chase. "The innings never got going even after that start. England fritted away and lost too many wickets too quickly. "It is unlikely it will be enough but we will find out in an hour’s time. "I don't know if they are a bit jaded the magic has deserted some of the key men. Morgan is a problem." "That really is an outstanding performance from South Africa bowlers. That does not really mount a massive challenge." Rabada bowls the last as the sun sets on Cape Town and he keeps South Africa's boot on England's neck with a series of yorkers. England are at least 50 runs short of what they needed. Really poor. "A one is a bonus. Inflation has set in, it is the new dot." England desperately need boundaries. They don't get any off Abbott, who claims a wicket before going for five singles off his final over. "I am just mildly exasperated. Rashid just needed to get bat on ball and he has played quite an extravagant shot. "It has all gone perfectly for South Africa." Frustrating. So frustrating. England needed at least 20 off these last two overs to claim a total that would even challenge SA, but Rashid starts them by slapping the ball straight to Amla for a catch off Abbott. It is all on Buttler and David Willey now. Buttler is swimming against the mightiest of currents now but he does his best with a pull shot for four in Morris' final over. Two wides help England take 10 off the over. Alby Stevens: Don't really mind this from England. Winning WT20 needs luck so if it comes off in 3 weeks we have a chance. Colm: What does Morgan do between ODIs - obviously not enough match time. "They need some magic now most obviously from Buttler who has been restrained. It is a pretty sorry looking card at the moment." England have nowhere near enough. And I can't see them changing the accuracy of that statement in the next three overs. A wicket and just four runs from that Abbott over. "England need Buttler on strike and need him to hit some boundaries. This is not enough." "It looked like it might have escaped his grasp but it bobbled up and Miller caught it at the third attempt." Jordan gone, courtesy of a pull to midwicket, where David Miller takes it at the third attempt. Rashid is next man. He is capable. But it will take something truly special to give England a competitive total. "At least Buttler has stayed in. He has been shackled, partly because of good bowling and partly because of the wickets falling around him." James: Stokes can't pick Tahir, Morgan offers up too many chances and Ali looks like he's playing with a flute. Mat Harris: How times change. Last year people were moaning England were behind the times. Couple of low innings and again moaning. England were 50-1 after six overs. In the 10 overs since they have added 56 and lost five wickets. Buttler tries to get something going with a slice through the gully region for four off Morris. That is his first boundary, off his 20th ball. Jordan adds another boundary with a top-edge from a pull. Small signs of life from the tourists. "England are going nowhere, very slowly." Vince Packham: Pure and utter rubbish! Why isn't Luke Wright in the team. He had such a good time in T20's recently and unlucky for Vince. BenHur: Kevin Pietersen has just scored yet another T20 fifty, this time for Quetta Gladiators! Hearing ECB?! Tahir bowls out. What a spell from the South Africa spinner. He has caused England all sorts of problems in his four overs, from which he claims figures of 4-21. Looks like a match-winning effort to me. "To be competitive you need to be at least at the 180 mark, so some work to do." Bradley Westlake: This is village from England. Just because we 'bat deep' (no contributions from the middle again) someone needs a level head. Jay: This is all part of a master plan designed to catch the other teams unaware and easily win the T20 World Cup. Surely? Rob Meech: Note to England: you don't have to slog every ball, not even in T20. A boundary. At last. The first since the eighth over. Jordan claims it off Wiese with a top-edge. It is the only notable blow of an over that completes a superb spell from Wiese. Fenners: Can't believe we make Tahir look so good! He's an average county player at best! Birding Vicar: England's inability to deal with Imran Tahir not boding well for World T20, South Africa in control. Richard Lancaster: Can we simply try and bat our allotted overs, we might become competitive again. Fondue lite: South Africa might just send out De Villiers by himself to chase this. Jos Buttler remains. As long as that is the case, England retain hope of a competitive score. But they are in big trouble. "I have to say Moeen Ali will be disappointed with that. He has been lazy with the shot, he didn’t really commit, hit it with loose hands and a solid catch. "England really are just folding and on a wicket like this it is not good news at all." Hat-trick ball. Oh, he is so close with a ball that nips right through Chris Jordan. He may even have nicked it. In that case, AB De Villiers has dropped a clanger. Tahir bounces down the track with his head in his hands. He has swung this game firmly in SA's favour. Tahir strikes again. Two in two. He is on a hat-trick. Moeen Ali walks in and walks straight back again after slapping one to the diving Faf du Plessis at short mid-off. "Tahir is off again like a sprinter who has just won the 100m Olympic final." Pressure. England have barely scored a meaningful run in the last few overs and this tells as Morgan miscues a ball from the returning Tahir to Wiese at backward point. "David Wiese has been really impressive. He has good variations." England are walking through treacle at the moment. Wiese is varying his length and speed to great effect while keeping a top of off line. He has now bowled three overs for just 11. Brilliant T20 bowling. Imran Tahir has done his bit. He is replaced by Chris Morris, who brings the England run-rate down again with an over that goes for just four. "Looking at the halfway point England, runs wise, will feel they have lost momentum especially after that electric start. A bit of work to do now, they want to make sure, on this wicket, they get close to 180." Fondue lite: Memo to England's batsmen: it's a 20 over, not a 20 ball, match. Chris Mitchell: Yet more brain dead cricket from England's top order....!! Do we never learn anything?!? Wiese is doing a sterling job for SA here. He gets through another cheap over, which goes for just four runs. England still have plenty of batting but they need to recapture some momentum. Ian Funnell: Thought Vince was unlucky to miss out before game. Never been sure of Root in t20 as always takes a few balls to get going. Chris Gunn: Does anyone know why Vince isn't in the England team? "England are slightly losing their way here, they like batting first as well." South Africa have done really well here. Tahir is at the centre of it. He has gone for runs but has taken two wickets. Jos Buttler is in. England could really do with something spectacular from him now. "That's a brilliant bit of flight and pace from Tahir. Stokes was long gone. He was done in the flight. It was a brilliant bit of bowling. I don’t think many would have picked that ball." This is a strange dismissal. Stokes smashes two fours off Tahir and then stabs forward at a googly, misses it and keeps moving forward, allowing De Villiers to whip off the bails and dismiss him. After a good start, England are crumbling. Ben Stokes joins fellow new man Eoin Morgan. Both on 0. Stokes doesn't stay that way for long as he claims a single to deep mid-off. Morgan is off the mark next ball but gets lucky as his cut goes through the hands of Rilee Rossouw and skips off for four. "The momentum has changed. There is a bit of caginess required from the two new batsmen. You cant bed in for a long time but you can't afford to lose another wicket now." Another England man goes as Root slices David Wiese's first ball to Rilee Rossouw at backward point. Two wickets in four balls. The momentum has swung in the home side's favour. England's progress checked. South Africa have claimed both openers and it is now down to Root and captain Morgan. "Somehow miraculously Duminy has held onto the catch and nobody has got injured." A blow to England, but almost a disaster for South Africa. Imran Tahir comes into the attack and Hales gets well underneath one of his fuller balls to send the ball spinning up to the fine leg area. JP Duminy and Kagiso Rabada have eyes only for the ball and just manage to avoid colliding nastily, with the former claiming the catch. "I think Rabada, even though he is only 20, is quite a cagey character and he is just going to go for yorkers more often than not which might be a good idea." The last over of the powerplay is a good one for the home side as Rabada does the business again. He is some find for SA, especially in the absence of Dale Steyn. Root pillages a four through point off the last ball to tarnish it a bit but the bowler has still done a good job for his side in the chaos of the first six overs. "Isn't it amazing when runs keep flowing that the fielder drops it?" England batsman James Taylor, who has been left out of the World T20 squad, believes this team can go far. "Not any easy one, but if you want to get rid of a player in top form, you need to take those catches. A life for Hales"
South Africa's first bowling change sees Chris Morris replace Kyle Abbott. Root clearly fancies a piece of him as he swings wildly at his first two before nudging to deep square-leg for just the one run. Back on strike, Hales - who has a shirt with his name and number on now - continues his assault by turning one away for four before being dropped by the diving JP Duminy from a pull to deep mid-wicket. How costly could that be for SA? South Africa are undefeated (W9 D3) in their last 12 matches against England at Newlands in international cricket (6 Tests, 5 ODIs, 1 T20I) with their last loss against them coming back in January 1957. "It was exciting while it lasted. It just got a bit close to his body and he didn’t quite time it. That is a pity from an English perspective because Roy was looking very, very good." Out comes Joe Root, who is a more subtle player than most, but no less effective for it. He gets off the mark first ball with a push off the back foot to the off side. A good over from Rabada. One wicket and just the three runs from it. South Africa needed it. South Africa strike back as England lose their first wicket. Roy miscues a short Rabada ball to Amla at mid-wicket and he takes the catch. This is the name of the game in T20s, either you strike or they do. The highest score made in a Twenty20 international here at Newlands is England's 188-9 against Zimbabwe in the 2007 World Twenty20. A certain Kevin Pietersen hit four sixes in a rapid 79 from 37 balls as England won by 50 runs. "What a magnificent shot that is from Jason Roy." "I think I'd have the slip out skip," adds Vic. Still plenty of empty seats in what is reportedly a sold-out stadium. Blame the rush-hour traffic. Those that aren't here yet are missing some big-hitting from England. Roy gets in on the action with a club to send an Abbott ball over cow corner for six before pulling a four to a similar area. The England openers are putting the power into the powerplay. bROCKerz: I'm still unsure on Jordan - he might be wayward, but I still remember his excellent super over v Pakistan! Amazing. Ben Morgan: England have apparently selected their best XI?? With Chris Jordan in it?? What has he done?? Good fielder but about it. Tim Williams: Why is Chris Jordan playing today? He is no use to us in next month's World Cup, so playing him now is truly pointless. "I would almost be frightened if I was the non-striker given how well Hales is hitting the ball." Hales has tape covering the name and number on his shirt - I'm guessing that is because it actually has another player's details on it. Regardless of whose shirt he is wearing, Hales has set off like a train. He swivels to pull a four off Kagiso Rabada's first ball and picks up further boundaries with a clip off his legs and a straight drive. Hales is seeing it like a beachball. England have batted first in each of their last six T20 matches and are undefeated in that span (W5 T1), though three of those wins were by five runs or fewer. "Hales is in tremendous form. What a great way to start for him." Alex Hales' last six scores: 57, 99, 65, 50, 112, 78. He is a man in form. He is quickly into his stride with a pull for four after Jason Roy's first-ball single. He then pulls another for two more. Abbott clearly thinks short is the way to go to Hales. 10 off the over. Good start for the tourists. Well played that cameraman. The teams are ready to play but he has to scarper quickly when he realises he is the reason we haven't started yet. Thinks he's Spielberg. There are still some dark clouds in the sky as Kyle Abbott prepares to deliver the first over. The forecast is OK, so hopefully we won't have any unwelcome interruptions. Here come the teams. South Africa first, followed by England. National anthems first, then we'll get down to business.